A Bunion is a painful bony enlargement along the big toe joint and is often a symptom of a structural problem within the foot. Pressure from tight fitting shoes or bed sheets can cause the nerve that travels over the bump to become irritated, in turn causing pain. Treatment Options: Conservative treatment options may include wider shoes, avoiding pressure in the area, padding, therapy or medication. 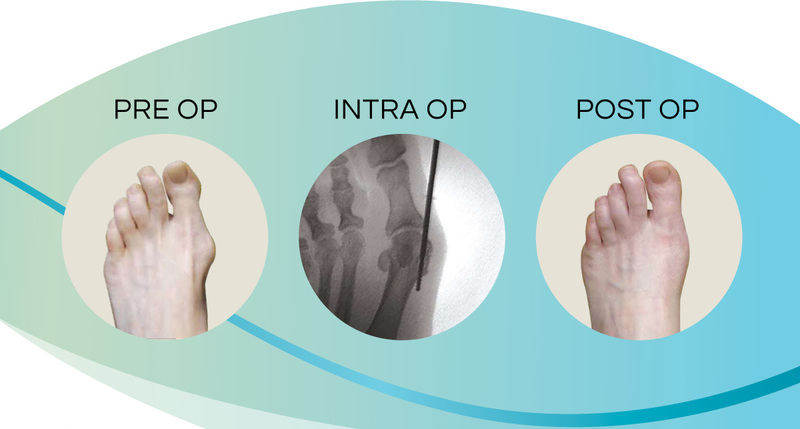 Modern Podiatry techniques such as Minimal Invasive Surgery have made treating the pain possible all within the comforts of our office. The surgery is performed under local anesthetic and is done through a very small incision and sutures are not always required. Digital radiography equipment is used throughout the procedure as you relax in our surgical suite. Regular activities may be resumed almost immediately and the pain eliminated. A thorough examination with your Podiatrist will help determine the best treatment options. Using only a local anesthetic, our patients sit comfortably in our surgical suite. Through a ¼-inch incision and the use of a digital fluroscopy the bony enlargement is reduced using surgical burs. Edema is minimized through compression and sutures are not always required. Following the procedure the patient remains ambulatory wearing practical footwear and can resume their daily activities almost immediately. There is little to no discomfort post operatively and the healing process is followed closely to ensure optimal results. Podiatry has enabled patients to relieve the pain of bunions at their convenience and with minimal disruption to their daily life.